Happy Quilting: The Simply Charmed Blog Hop - Day 7 is at Twin Fibers!!!! The Simply Charmed Blog Hop - Day 7 is at Twin Fibers!!!! Today Jessica has such a great tutorial put together for you all. 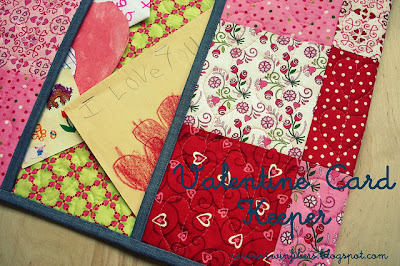 She has whipped up this super clever Valentine Card Holder. What an fabulous idea!!! I so need one of these to keep those cute handmade cards my kids make me. Oh, and while you are at Twin Fibers, don't forget to leave your comments for a chance to win a $25.00 Gift Certificate to The Intrepid Thread!!! Thank you Julie for your gracious sponsorship!! The Valentine Card Keeper is awesome. I think these would also be great for other holidays as well as birthdays! !